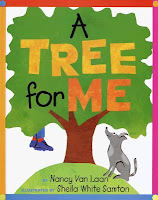 Last week, I had a visit from a Head Start class and they requested a storytime about trees. I had never done that theme before and was surprised by the fun storytime books I was able to find. They were a great group and kept saying how much they loved the books I picked up. Bonus: they sang songs to me at the end of storytime to help prepare for their upcoming school program. Huzzah! Book: The Apple Pie Tree by Zoe Hall, illustrated by Shari Halpern (Blue Sky Press, 1996). I started with this one because it gives a good overview of a tree going through different seasons. 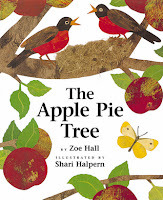 There's a lot to talk about in the pages of this book - we talked about the birds making a nest and what the apples looked like as they started out and how they changed as they grew. I use the alligator puppet for this one as we snap the monkeys out of the tree! Doing this rhyme reinforces counting skills and lets children hear rhythm and rhyming words, which increase phonological awareness. Teasing Mr. Alligator, "You can't catch me! You can't catch me!" And SNAPS that monkey out of the tree! Book: A Tree for Me by Nancy Van Laan, illustrated by Sheila White Samton (Knopf, 2000). This book has a repetitive, rhyming text that is a lot of fun to say and the kids enjoyed chiming in with me on the repeated bits. This would make a great felt story (I set Ms. T to work making one!) because with a little visual aid, I think the kids could chime in on the entire refrain. Again, the rhythm and rhyming words help increase phonological awareness. There are also some great vocabulary words in this book - "possum" and "quarreling" are two that I talked about with this group. This book features an African American family (we see them at the very end), so it's also a decent title for some everyday diversity in your storytime. I like to do this song with scarves and we pretend the scarves are the leaves falling down and then blowing round and round. I extend our scarf songs and rhymes with a few easy activities that you can read about at the ALSC Blog: Using Scarves in Storytime. 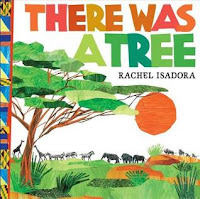 Book: There Was a Tree by Rachel Isadora (Nancy Paulsen Books, 2012). This take on a traditional song is set in Africa. I love Isadora's colorful illustrations and her African settings to add some diversity to my storytime. I wasn't sure how this would go because I had never tried a repeating song with a preschool group, but with the help of their teachers it went well. Singing in storytime is a great activity because singing typically breaks down words into syllables, so that activity helps kids hear that words are made up of smaller sounds. 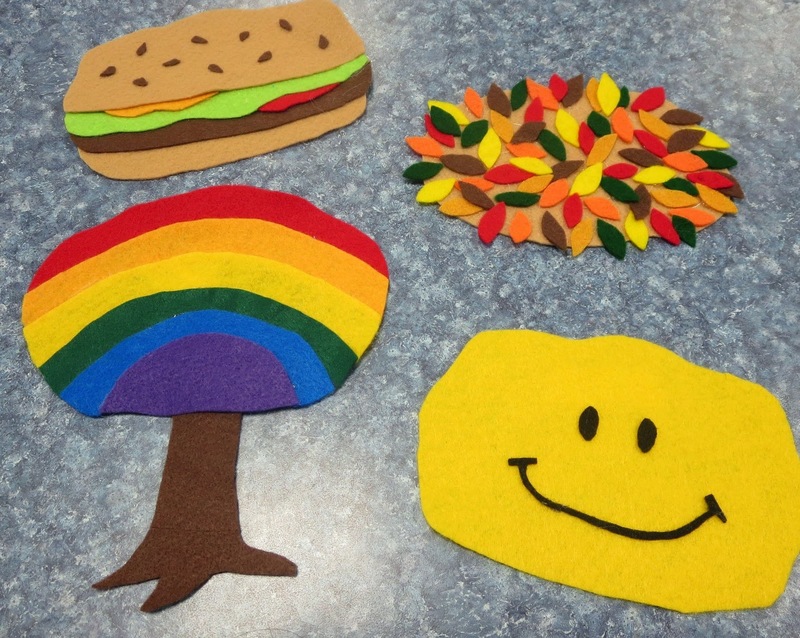 Felt Story: Fall is Not Easy (based on the book by Marty Kelley - Zino Press, 1998). This silly story about a tree that keeps changing its leaves is just plain fun and it's always a crowd-pleaser. The rhyming text is usually drowned out by laughter. 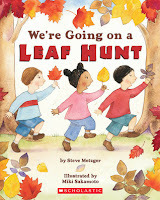 I had pulled the book We're Going on a Leaf Hunt by Steve Metzger, illustrated by Miki Sakamoto (Cartwheel Books, 2008) to use with our felt leaves, but we ran out of time. The structure of this story is based on We're Going on a Bear Hunt, so you could read it and do actions with it and/or pass out felt leaves and ask kids to bring them up as you get to that color tree (red, orange, yellow, brown).